I just heard about this new watch/automatic lap counter today and it looks like it could be a useful training tool. Swimovate's Pool-Mate is an automatic lap and stroke counter that works with the four most common strokes. The watch uses motion sensors along with "unique software algorithms" to recognize each stroke and each change of lap so that you can focus on swimming and not on counting strokes and laps. 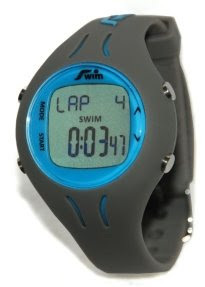 The Pool-Mate will display Lap Count, Time, Average Strokes Per Lap, Speed, Distance, Calories and Efficiency. The watch has been tested on a wide variety of swimmers over an 18 month period prior to launch. The manufacturer claims to have a 99.75% accuracy rate although no guarantee is given for accuracy with individual swimmers and rates may differ with users whose strokes or abilities differ from the norm. While the Pool-Mate seems to be a great tool for pool swimming and training, it unfortunately is not designed for open water swimming. The manufacturer's FAQ has this to say about open water: "This version of the Pool-Mate has been designed for lap swimming in a pool only." This seems to imply that there might be an open water version in the future. The website does not offer any details on how much the watch will cost, but it is expected to be released this summer.